Openmoko is a software distribution stack that sits on top of a hardware platform. The Neo1973 phone is the first hardware platform to take advantage of Openmoko. You can find specifics of the Neo1973 Hardware by reviewing this introduction page and the pages in the category as shown at the bottom of this page. Note that this page is about the first Openmoko phone which is now discontinued. 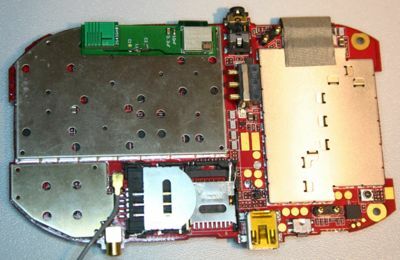 See details on the second Openmoko phone at this page - Neo FreeRunner GTA02 Hardware. 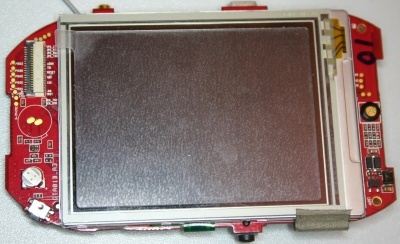 For the purposes of acquiring/cutting a properly sized screen protector, the display hole of the case is about 45 x 59 mm, while the top cover internal frame can house up to a 53 x 74 mm protector; sizes much larger than the display hole would obviously necessitate removing the front cover for installation. Bluetooth Headset This one is wired via PCM bus from the CSR Bluetooth chip to the Wolfson codec. I2C Devices The I2C is a simple communication standard intended to move small amounts of data a few inches between chips. Please see Neo I2C Devices for more information & a list of devices & the addresses currently in use & documented for the Neo1973. CE compliance is needed before a product can be sold in the EU. The CE mark indicates that a product complies to the relevant legislation, defined in the harmonised standards. This refers also to the most relevant, for the Neo1973, Directive 89/336/EEC on electromagnetic compatibility (EMC is the art of assuring electromagnetic compatibility between products). The standards are defined by CENELEC (European Committee for Electrotechnical Standardization), but not verified by any authority. It is the responsibilty of the manufacturer to convince himself that a product is in compliance, and is obligated to be able to prove this (with relevant technical documentation) for a specific product to the authorities on request. Whether the current Phase 1 devices are actually tested against the directives are unknown, no documentation has been disclosed, other than the fact that the devices bear the CE mark. This page was last modified on 10 February 2012, at 08:25. This page has been accessed 305,245 times.